Day 3: List about five places that you really want to visit and why. And we're already on the third day of the 30-Days Journal Challenge! Wooooooo! And it's another list. Well, I really don't have much to say beforehand, so let's just get straight to the point. If I had the chance to travel to London, England, the first place I'd want NEED to visit is this library. It's located in London, and houses more than 170 million items—13.9 million of this which are books! That's a lifetime worth of reading! I want to visit this library to gather up all sorts of inspiration from all the kinds of books they have there. Perhaps learn more than I can about literature. Or maybe read up some tall tales and mythologies and legends. Or maybe I can just read some manuscripts to expand my knowledge. Who knows what information they yield? —credits to wikipedia.org for the image. One of the many flower fields of Hokkaido. Japan has always been one of my top countries to visit ever since I was a kid. But the only place in the country that has won my heart is the island of Hokkaido, the northmost main island of the Japanese archipelago. Hokkaido is simply breathtaking. I mean, just look at those fields! It's a perfect getaway or for a honeymoon. :3 Not only does it have such a landscape, Hokkaido is also filled with lush flowers of different species. The air must be perfect there. No pollution, all quiet, definitely my kind of place to be. —credits to bestregardsfromfar.com for the image. Even the building itself is a work of art! Located in Paris, France, from outside, it looks like any mediocre glass pyramid. Inside, however, is where famous artworks like Mona Lisa, by Leonardo da Vinci is exhibited. Oh, did I forget to mention they are all the real things? I want to visit this place just to stare and marvel at all the paintings and sculptures—especially Mona Lisa. Even sculptures like Venus de Milo and artifacts such as The Code of Hammurabi way from Mesopotamia are situated there. It baffles me to think how these works can be preserved for so long in perfect condition. —credits to onedollarphotos.com for the image. One of the most famous and iconic national parks in the world. 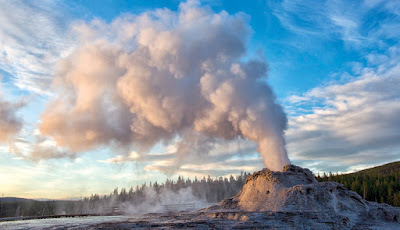 It's located in Wyoming, USA, and known for its multiple geysers shooting steaming water into the air. The park is also huge, occupying parts of both Indiana and Montana. Yellowstone is one of the places I really want to visit because of its uniqueness. Geysers, springs, serene atmosphere and landscape, clean air—need I say more? I could just rest under one of the trees there and write, with the sounds of gushing water undulating my thoughts. —credits to yellowstonepark.com for the image. —credits to me for the image. Are any of my favored places in your wishlist too? May I know your locations that you so want to visit? Let me know! There's a supervolcano at Yellowstone! I hope it doesn't erupt until the next millions of years. I don't think we'll ever know when it does. The Kingdom of Seriquas. If only it exists, I would definitely go there! That's strange... What about Seriquas that makes you want to go there? I read about the novel that you wrote. 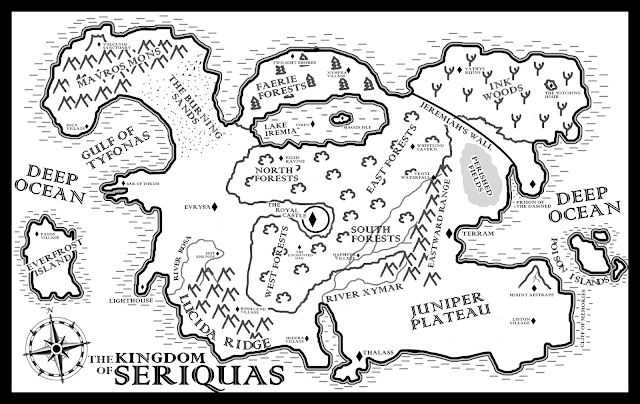 According to your novel, Seriquas is a wonderful place, covered with beautiful forests and mountain ranges. It's a place where I can enjoy nature. I would also love to meet the characters in The Kingdom of Seriquas! Haha. I'm aware of that! There must be a reason why you choose Seriquas as your imaginary kingdom (did I say imaginary?). With all the forests and mountains, it sounds like the Twilight Saga's setting (no offense)I am a fan of that sagas and purposely bought 4 novels before they were transformed into movies. Hmm, mountains...make me to recall my recent memories when I went back to my hometown. I wanted Seriquas to have multiple biomes, yet all fit together and makes sense for such climate to happen. And turns out, it works perfectly (with all the lores and stuff)! Stephenie Meyer's Twilight is definitely better written than portrayed in the movies. No shame in buying more books than you can read at one time--I do it all the time!